You’re America’s biggest-selling rock'n'roll band of all time, entering your fiftieth year. You want to do something different and fancy dialling down the touring. What do you do? How many other bands at this level are still performing with their 70s lineup intact? U2 are one, ZZ Top another. Rush were until recently. Fleetwood Mac would be if not for their ongoing civil war. Aerosmith, though, can still boast their classic lineup of Steven Tyler, Joe Perry, Brad Whitford and Tom Hamilton. And judging from their on-stage banter and non-verbal communication, they actually seem to still like each other and love what they do - an even rarer thing. This writer asked the show producer earlier in the day what allowances were made for the age of the band (Tyler is 71, the others all late sixties) but felt pretty dumb once they hit the stage. Tyler bends and twists like a demented cat and scampers across the stage with the fervour of a dude half his age. He’s a ludicrous character - made to look all the more so by the gentle presences of Whitford, Kramer and Hamilton - but you just can’t take your eyes off him. The only uncomfortable moment is when Tyler takes his shirt off near the end, driving ladies of a certain age wild, but you do have to wonder at the positive long-term effects of the Toxic Twins’ narcotic diet of old. A 25-minute pre-show film - a little too long for some - takes you through the history of the band, with audio produced by Grammy Award winning producer (and son of Sir George), Giles Martin. There’s a touch of Vegas showbiz in the dancers and live action characters who roam the stage. This is a Big Production which you’d think would be restrictive for a band used to 50 years of turning up and plugging in, but the theatrics are never at the expense of the music and it still feels like a rock gig at heart. The 90-minute set may be shorter than their full touring show but the energy levels are maintained throughout and, frankly, you’re left wanting more. The setlist spans five decades, kicking off with Train Kept A Rollin’, Mama Kin and Back In The Saddle Again; it’s 25 minutes into the show before they play a bona fide hit single, the sublime Sweet Emotion. Surprisingly, considering the venue and audience, they steer wide of their countless chart-dominating ballads, although when I Don’t Want To Miss A Thing rolls around, complete with cheesy string section, the lighters and iPhone torches finally come out. (We spotted the song’s writer, Diane Warren, beaming from the crowd, possibly thinking of her bank balance). The evening closes with their original version of Walk This Way, the song which revived their careers with their pioneering Run DMC collaboration in 1986. Touring can play hell with a band’s sound quality, with constantly changing venues, indoors and out, and short set-up times. The advantage of staying in one venue is the focus that can be given to the aural experience. Show producer Steve Dixon brought in THX, famous for certifying top-end cinemas and L-Acoustics’ L-ISA technology to create a hyper-real and immersive soundscape you’d only normally experience watching a Hollywood blockbuster. This show has 230 speakers, compared to the 40-50 you’d normally have at an arena. The result is extraordinarily well-balanced, immersive sound, regardless of where you’re sitting. Louder even snuck into the THX-certified on-stage section, with access to "studio-quality" (i.e. the monitor mix) audio direct from the Aerosmith mixing board using audio technology from MIXhalo (co-founded by Incubus guitarist Michael Einziger) and a pair of THX-certified 1More triple driver in-ear headphones. 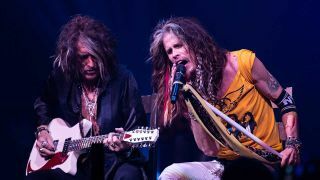 We could choose from either Steven Tyler or the band’s sound mix in an experience that more and more bands and promoters are likely to offer in the future. Parked in the foyer of the theatre is original Aerosmith’s beaten-up tour bus, replete with pull-out table and vinyl tablecloth. It’s a far cry from where they are now, grossing millions of dollars a night and asking their fans to travel to Las Vegas to see them. If you’re lucky enough to be able to afford it, though, it’s a journey worth making to see one of America’s greatest good-time bands, combined age of 341, who still rock harder than most.